What Does a Mathematics Major Study? Mathematics has held an established position among the humanities for more than 2,000 years. Mathematical knowledge, with old questions being answered and new ones asked, is growing at an unprecedented rate. Here is a sample of some of the courses and topics you will study as a mathematics major at Wright State. Calculus: Calculus is a cornerstone of analysis and an indispensable tool for most of the sciences and engineering. You will study three semesters of issues as diverse as the conservation of energy laws from physics and continuously compounded interest from banking. Linear algebra: Algebra is criticial to applications from management to structural engineering to telecommunications. You will study a semester’s worth of linear equations—but with the possibility of thousands of equations in thousands of unknowns—leading to abstract mathematical spaces. Advanced courses: In Theory of Statistics you will apply multivariable calculus in probability and the mathematical foundations of statistical inference. Learn how to collect and analyze data in scientific and industrial experiments when you enroll in Statistical Methods and Introduction to Experimental Designs. Computer science: If you are looking for mathematics courses with special significance in computer science, consider Applied Graph Theory. This course features mathematical models and algorithms you may someday apply to problems such as traffic systems, activity scheduling, and design layout. Others courses that are likely to apply to those seeking a career in computer science include Cryptography (how to encrypt data securely) and Coding Theory (how to send messages that self-correct transmission errors). Physical sciences and engineering: You can take courses that emphasize mathematical theory and problem solving methods directed toward the physical sciences and engineering. Partial differential equations involve several variables (e.g., both space and time) and describe, for instance, the propagation of electromagnetic waves through space and the flow of heat in solids. Pure mathematics: You can understand the theoretical foundations of algebra, calculus, and other elementary courses while preparing for more advanced topics in modern mathematics. Sign up for Real Variables (or theoretical advanced calculus) to learn why the facts and computational methods learned in ordinary calculus are correct. Enroll in Modern Algebra and study abstract systems that include the familiar objects of school math (whole numbers, rational numbers, real numbers, etc.) as special cases. Free electives: You are required to complete general education courses in history, English, economics, etc. 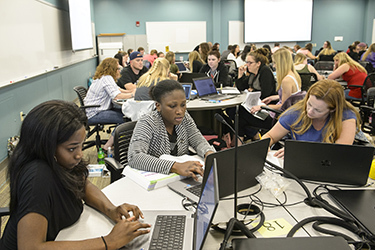 Wright State's degree programs in mathematics also have a generous allotment of “free electives”—courses you can choose from essentially any area of the catalog. This is just one example of how we at Wright State listen to you and try to understand exactly what you are attempting to achieve.